Watch this video of what can and often does happen in the data center-Data Center Fire. Who needs this kind of delay! Don’t let your batteries get this bad, the risk is too great! Batteries are most likely to fail when you need them most, during a power outage! Batteries are much more likely to fail after 3 years of age or sooner in hot environments. 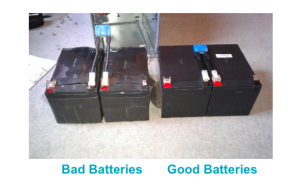 Batteries need routine maintenance to provide the best reliability. It only takes one battery in a string to take down the whole UPS during an outage. Batteries may fail during next power outage! Batteries may swell and be almost impossible to remove. 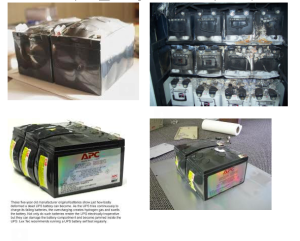 Batteries may leak acid creating a hazardous condition. For more information on the UPS systems from 500VA to 500KVA contact the experts at UPSProtection/Automated Power click here or call 800.755.0080.